When I first started researching seedless grapes, the consensus appeared to be that they were very difficult to grow without spraying. "Whatever," I thought naively. "My grapes will do fine." The Mars Seedless on the left shows what generally happens with that kind of attitude. 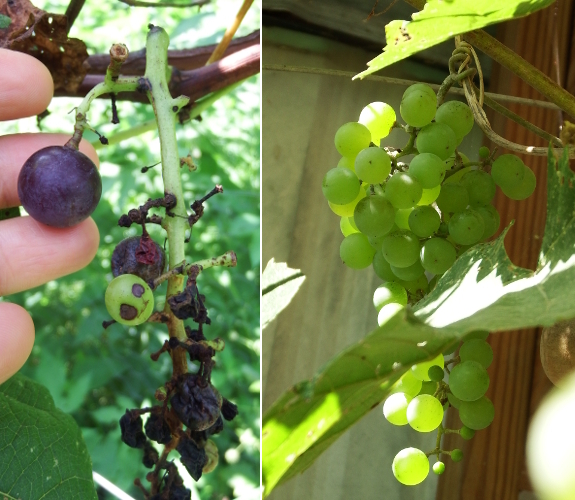 Fungi began attacking the young grapes over a month ago, and at first I plucked off the affected fruits whenever I noticed damage to prevent the disease from spreading. Eventually, though, I threw up my hands and let nature take its course. And, in exchange, nature provided one ripe grape. The lone fruit was tasty...but not a very good harvest from two vines that have spent nearly five years in the ground. In stark contrast, Reliance is continuing to live up to its name. I started the vine on the right from a cutting less than three years ago. It's already fruiting, and after picking off only one or two blighted grapes, the clusters are now pristine. One was already ripe enough to eat and it definitely hit the spot! Guess which variety is going to replace the troublesome Mars Seedless this winter? I just planted three seedless grape vines this year. Glenora (black Concord-like grape), Reliance (red grape) and Somerset which is a red grape with strawberry overtones. The vines are doing well, but the (expletive deleted) Japanese beetles, who formerly were eating all the leaves all my fruit trees, are now eating all the grape vine leaves!!! I bought traps. Why the heck can't they eat my neighbor's 1/2 acre of crappy blackberry brambles??? Nayan --- I'm afraid your traps are at least part of the problem. As I explain in The Naturally Bug-Free Garden, Japanese beetle traps end up attracting more pests than they capture, so they're a bad idea in the home garden.